I spent more time on the grid in 2011 than ever before and one of the interesting benefits of this was the level of details I started noticing in some of the helmets. On TV, or even at trackside, it's difficult to see exactly what the helmet designers have done to make each rider's crash hat unique. 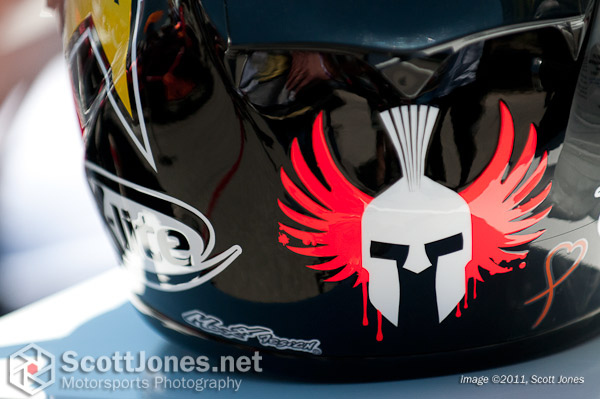 So I started grabbing a few close up shots of helmets as they popped out of the hustle and bustle that makes up a G.P. grid. This collection is arbitrary in that I made no effort to look at each helmet to find the best ones. There simply isn't time to do that, nor is it possible to look in a systematic way since the bikes arrive in an unpredictable order, and the grid itself is a fairly hectic space until right before the start when they kick us off.